After Hurricane Andrew had blown ashore, I sat on my sofa watching in disbelief at the devastation. … I couldn’t stand to listen anymore and just sit there. Within two weeks Robert and I had organized two tractor trailer loads of supplies and I was southbound with them headed to Miami. What I discovered when we rolled in was nothing like I had seen on TV. It was much much worse. The disarray, the suffering and the magnitude of it was mind blowing, life changing. Life changing needs to be repeated – that was the first experience I had where I felt like I made a difference in someone’s life. A big difference! I registered as a volunteer about 3 months before I had a chance to go on my first deployment. I really thought I would just go and do something that I enjoyed doing, which was cooking BBQ and never really gave it very much thought about the people I would be helping. The first couple of days of deployment was just as I had thought it would be. Then one day I was asked if I would mind taking some meals out in the field. The response from one man affected is when I realized my life was going to change. He told me “I didn’t realize there was anyone left on Earth that cared enough to help take care of my family.” The work I do now for OBR is strictly out of passion for helping others . On April 27, 2011 a multiple vortex EF4 tornado swept across the state of Alabama, and wiped out a large portion of Tuscaloosa, AL, where I grew up. I spent several weeks helping my family and friends repair property damage. During that time we were blessed by various people and organizations that helped us in our time of need. In May 2013 my friend, John Wheeler, invited me to join him in Moore, OK to help an organization I’d not heard of at the time feed victims of the tornado that had recently hit the town. This was my introduction to Operation BBQ Relief. Over the course of a week we fed victims and first responders and met many people that had been through what my family had been through—and I knew this was something I wanted to be a part of. Working with OBR is my way of giving back for the kindness we received in our time of need. I never thought I would have to depend on the kindness of strangers, but I’m thankful that it led me to OBR in its roundabout way. It’s a truly humbling experience to know that we are able to comfort others with a hot meal and a word of encouragement and I’m grateful for the opportunity to repay my debt of gratitude. Last year, in June 2016, I was at a crossroad in my life. I had been laid off from my job as a Culinary Teacher. I was able to jump in with OBR in Nitro, West Virginia. I felt purpose through humbly serving precious people. In August 2016, I responded again to OBR in Hammond, Louisiana for 13 days. This was some of the hardest work and longest days of my life. Instead of being tired, I was energized by the adrenaline that comes from the knowledge of being able to serve rather than being served. What I mean by this is, how blessed I felt that I could be used to serve disaster victims and that I wasn’t the one being served, that I was so blessed to have not been flooded in my town. There is an inborn gnawing in my heart to feed people. I feed folks because doing so brings a joy that nothing else can. As a believer, I know I can show that God’s love is more than suits and Sundays and padded pews. We can show the same love one hot meal at a time. I no longer compete in BBQ Competitions, and in 2014 I started attending BBQ Competitions in Ohio and Indiana, and setting up a booth for OBR to recruit volunteers and to collect donations. I’ve also helped start “The Dino Bone Throwdown,” which helps raise money for OBR and provides another chance to compete for competitors. I have also joined the OhioVOAD and the IndianaVOAD (Volunteer Organizations Active at Disasters). I went to school in southeast KS at Pitt State University in Pittsburg, KS (about 30 minutes from Joplin). On the night of the tornado my wife and I were listening to a police scanner hoping it wasn’t as bad as it sounded. We had a lot of memories and friends in and around Joplin. When I woke up in the morning the news showed the devastation. I went online and found Operation BBQ Relief for Joplin on Facebook. I knew Stan and Jeff, but only from competing against them. I remember talking to my wife and her looking at me like “Why are you still standing here?” I reached out to Stan, and and was soon on my way. I was asked about being a State Lead while at a SCA Steak cook off in Kansas, and after giving it some thought I decided to take the offer. In March of 2016 I really got involved – that was the flood of the year (at the time) in the Louisiana. It was in my hometown of Shreveport. I was asked to run the Deployments since I had contacts in my area. That’s when I really saw how giving the people of OBR are, how big their hearts are to drop what they are doing, leave their jobs and their businesses, families and kids behind and go and help those in need. 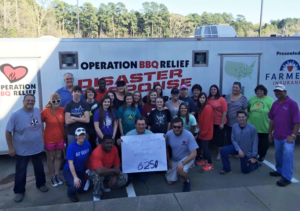 We had OBR folks from all over the country show up to help, and ended up feeding 58k meals in 7 days. To say that this was a life changing experience would be a understatement.